Do you encounter any hazardous materials in your workplace or environment? Are you responsible for the proper handling, storage and/or transportation of hazardous materials? Are you affected by any health, safety, product stewardship, or life cycle-related decisions regarding the use or disposition of hazardous materials? If so, you should have the Certified Hazardous Materials Manager (CHMM) credential from the Institute of Hazardous Materials Management (IHMM) that recognizes your responsibilities, training, and expertise. 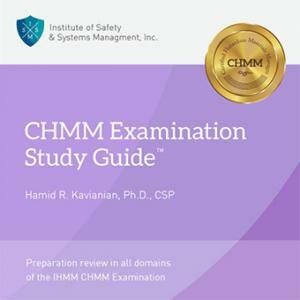 The CHMM Examination Study Guide™ is now available to prepare candidates for certification by IHMM. The Study Guide follows the current IHMM examination “Specification Blueprint.” A new user interface improves the user experience making this interactive, self-paced, learning program more enjoyable to use. Included are study sessions on many topics and quizzes developed to quickly build your knowledge, by allowing you to turn solutions on or off and also to bookmark questions for later study. Take the 109 question, timed, practice examination at any time to focus your study, and review your scores in all subject areas. The practice exam is refreshed with new questions to test your knowledge each time you take it. Internationally-recognized credentials promote career advancement and recognition of subject matter expertise in the field of hazardous materials management. IHMM and its credentials are accredited by the Council of Engineering & Scientific Specialty Boards (CESB) and American National Standards Institute (ANSI). Purchase the CHMM Examination Study Guide™ and prepare for the CHMM Certification Examination tomorrow!